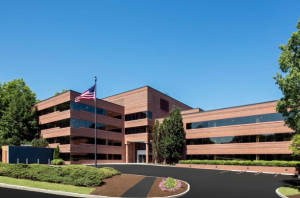 Shire Pharmaceuticals, one of the leading global biopharmaceutical companies, expanded its footprint in Massachusetts last spring with the acquisition of two properties in Lexington. This sale allowed Shire to expand its total occupied space in Lexington to over one million square feet. Ver-Tex is proud to have worked to shine new light on both of these properties. The first property is located on 45-55 Hayden Avenue in Lexington; Consigli Construction served as the general contractor on the project. We installed roughly 250 Lutron Sivoia QS motorized shades in the large office space. The second property is located at 95 Hayden Avenue. Columbia Construction was the general contractor on this project, which involved the installation of approximately 300 Lutron Sivoia QS motorized shades. This five-level space is extremely large at 200,000 square feet and was designed to accommodate more company growth. Shire opened its new offices early in the summer last year, and they currently host over 800 employees. Shire’s new space in Lexington will serve as the company’s U.S. headquarters, and will have its largest concentration of employees. In addition to Lexington, Shire also has property in Cambridge, Waltham, North Reading, Belmont and Burlington. The Ver-Tex team also completed another project at their lab on Binney Street in Cambridge, where we installed stainless steel corner guards and a Life Science Products stainless steel crash rail. We look forward to watching Shire continue to grow and bring groundbreaking products to the medical field. No matter what size the commercial space, our design experts can work with you to find the perfect shades to take your building to the next level.